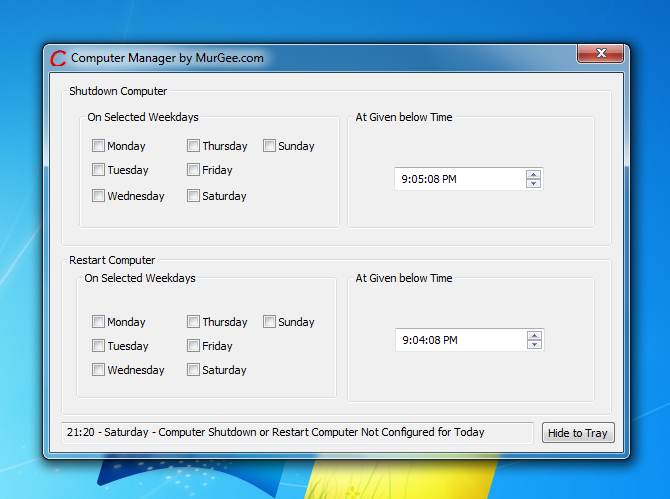 Shutdown Computer daily or on selected days using Shutdown Manager feature of the Computer Manager Software Utility for Windows. You can configure to Shutdown a windows computer by selecting days on which you want the computer to shutdown and specify a suitable time using easy to use controls. When the Computer Manager Software initiates a System Shutdown, it will display a confirmation screen for 30 seconds and in case you do not cancel the confirmation screen, the computer would shutdown. The Shutdown Manager is designed to shutdown the windows computer brutely so that irrespective of any open documents or applications, Windows will shutdown at the configured date / time. The Software sits in the System Tray and an optional Desktop Icon can be used to launch or open the the main screen of the Computer Manager which can be used to shutdown computer daily or at selected days. The Shutdown confirmation screen will be displayed on top of all other applications / documents for 30 seconds so that in case you want to cancel the software initiated Shutdown, you can simply hit the cancel button. Yes this Computer Manager software to Shutdown a Windows computer works on Windows 8 computer as good as for Windows 7, Vista, XP and other Computers. In case the signed on user does not have appropriate rights to shutdown a computer, this software will not work and will not display any error. This software application runs as an application and not as a Windows Service. There are benefits of having the Computer Manager Software working as an Application. Easy Configuration, Easy Control and easy to close the application. Just hit the top close button of the application and the application will not shutdown the computer if configured for today. The Setup of the Software add an entry to Registry to Auto Start this application when user signs on to the computer. This application will start in System tray when the computer is Started, Restarted or when user logs out and login in again, just like any other application in Windows Startup. Watch a 2 minute video tutorial of the Computer Manager Software to see all the features of the software or Download it and give it a try on your own Windows 8, Windows 7, Windows XP, Windows 2000 or any other Microsoft Windows Computer. This software is a shareware software and you can download and try it for free. There are No Popup of Reminders in the application and it will work as good as full version software untill the trial usages have been used. This Computer Manager Software can be sued to Shutdown or Restart a Windows Computer in really easy way.